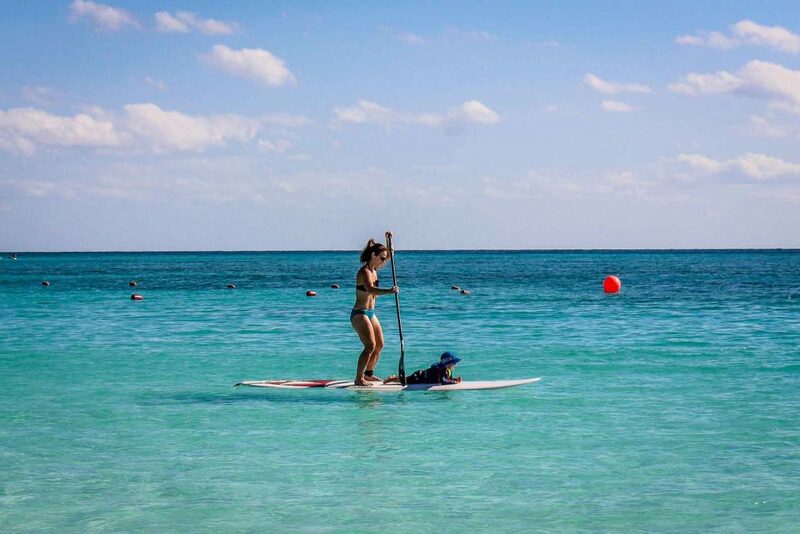 The Mayan Riviera in Mexico is a popular destination with families and for good reason. 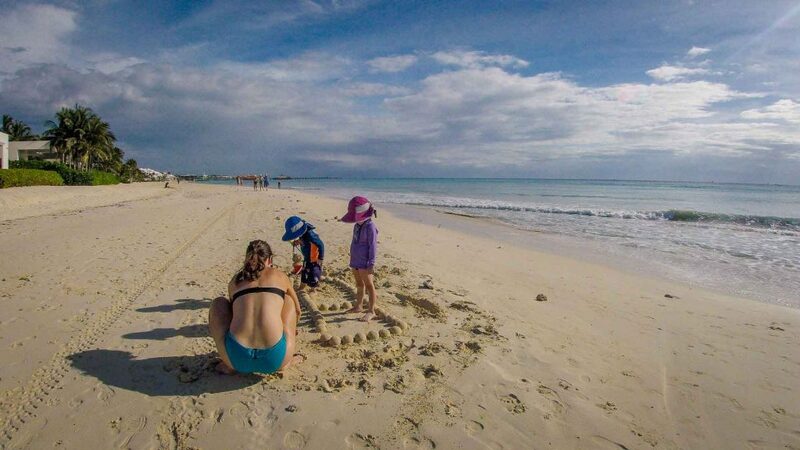 There is so much more to do than just beaches, when traveling to Mexico with a baby or toddler. If you are looking to escape the winter this year, put this on your list of places to go. It’s a place we have been to several times before kids and twice with our kids as toddlers. 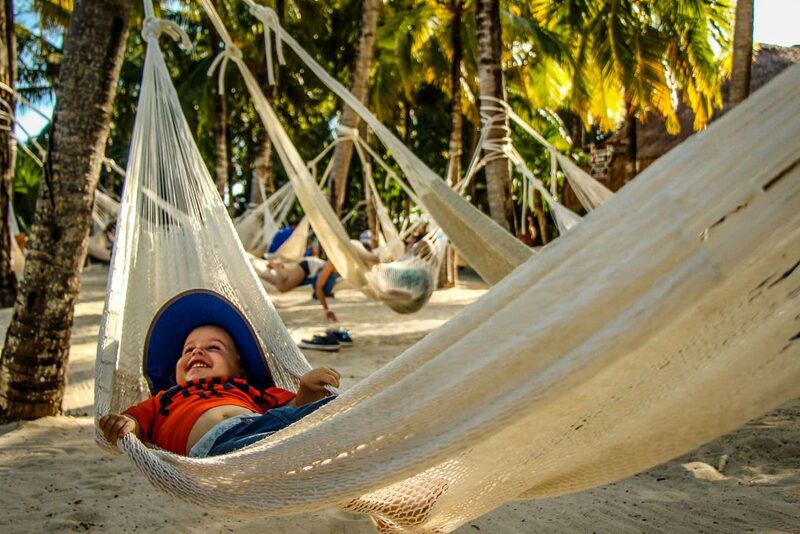 With so many options in the Riviera Maya, we think it’s one of the best places to travel in Mexico with a toddlers or babies. The first time we went to Mexico with a baby was when our daughter was 18 months old and I was pregnant with our son. This was before the threat of Zika and it was the perfect spot for a babymoon. We stayed at an all-inclusive resort that was one of the best Mexico resorts for toddlers because there was so much to do, so much so that we didn’t even feel the need to leave the resort. 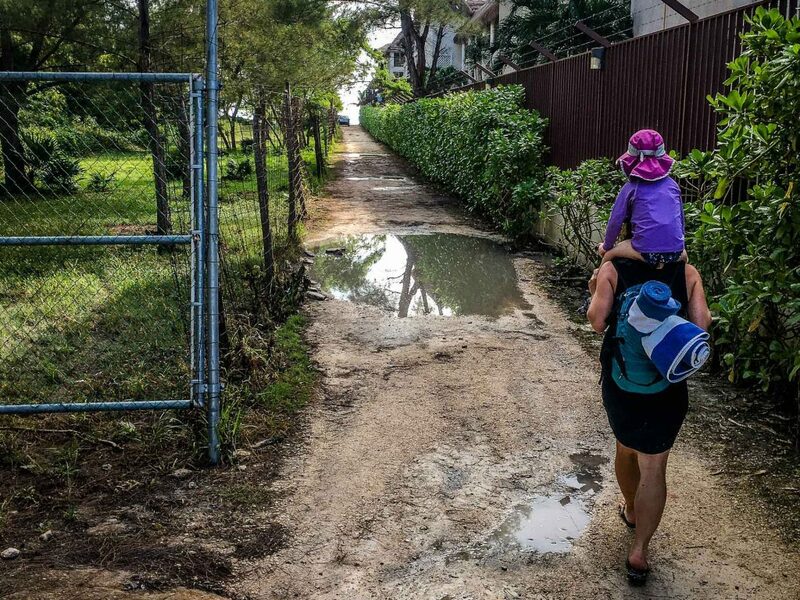 A few years later, we returned to Riviera Maya with a toddler (our son was 2 years old and our daughter was 4 years old). This time we rented an Airbnb apartment in Playa del Carmen, had a car rental and explored the entire region. 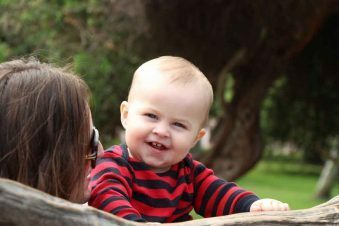 Is it safe to take a baby to Mexico? Yes, you can safely take a baby to Mexico with some precautions. 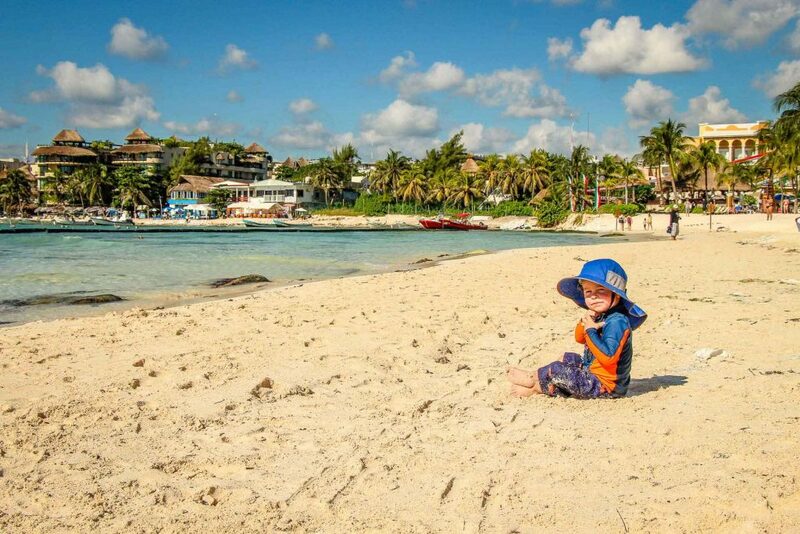 Here are our tips for taking a baby to Mexico. Talking to your pediatrician is always a good place to start, especially when it comes to sunscreen, bug spray and how to handle any tummy issues. Visit a travel clinic to understand any necessary vaccinations for Mexico. Bring a sun hat, rash guard and even a tent to give your baby the best sun protection. Keep your baby well hydrated and know the signs for dehydration in your baby. Have a plan for washing baby bottles and mixing formula, like this portable kettle for boiling water. Use only bottled water to be extra safe. Bring a stroller with a good canopy for excursions. Find a resort that caters to babies and toddlers, and might be able to provide healthy food options if your baby is on solid food. 1 Is it safe to take a baby to Mexico? There are so many choices when it comes to deciding where to stay, from Airbnb apartments to all-inclusive resorts. The area you choose will also have an impact on what you see and do, especially if you don’t have a car rental. It’s best to figure out your budget and what you want to do in the time you have, then decide which area suits you best. You’ll have to choose between places like Isla Mujeres, Cozumel, Cancun, Playa del Carmen, Tulum and everything in between. One thing to keep in mind, especially when travelling with a baby or toddler, is the distance of your resort from the airport. Though most all-inclusives will provide shuttle service, it may not go directly to your resort resulting in a longer trip than you had expected. You can read more about our first time in Mexico with a toddler, when we stayed at an all-inclusive for a week. With such little time, we chose a resort that had plenty for her to do so we wouldn’t be taking tours all week long. This was all about relaxation and keeping a busy toddler occupied. The second time we stayed in Mexico for longer, so we wanted an apartment where we could do laundry, have separate bedrooms and cook some of our own food. Our original plan was to stay in a place where we could get to the beach without a car rental and where we could walk everywhere we wanted to go. Playa del Carmen ended up being the best choice for us, however in the end we rented a car and our plan to have a quiet time just hanging out on the beach turned into something very different. We ended up out doing something new almost everyday. 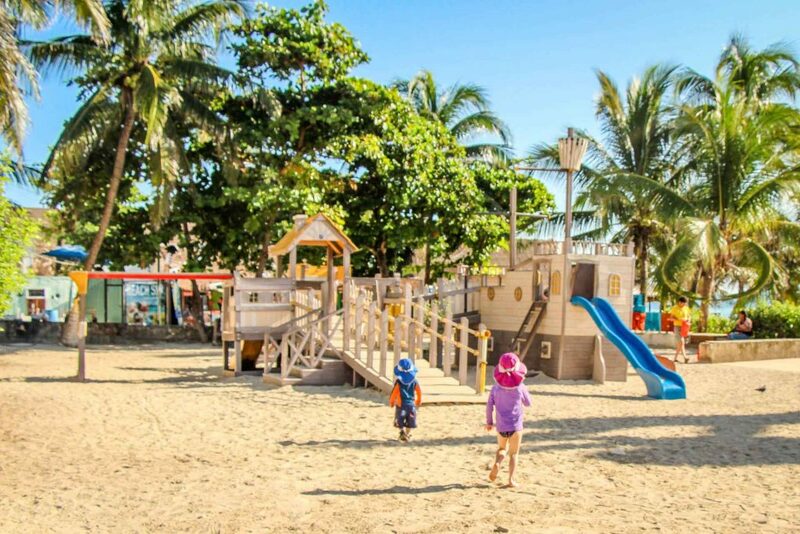 If you are interested in staying at an all-inclusive, check out our baby and toddler friendly resorts in Mexico. If an Airbnb sounds good to you, sign up here and get $34USD off your first rental. If food and water is a concern for you, we wrote a post all about how to handle food and water in Mexico especially when renting an apartment. If you are taking your baby or toddler to an all-inclusive resort, you have very little to be concerned about. Bottled water will be provided and a reputable resort will take all the necessary precautions with the food. 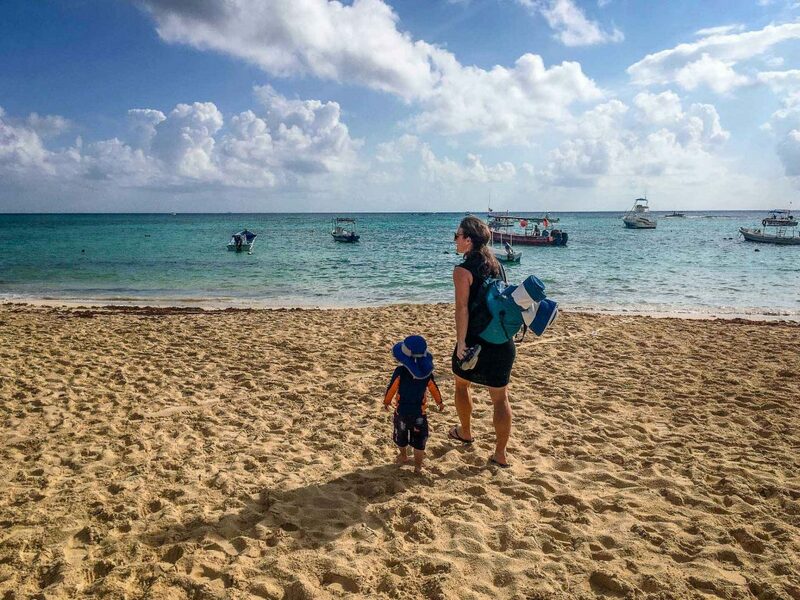 As for snacks and meal time at an all-inclusive with a baby or toddler, our post on taking a baby to an all-inclusive resort covers this plus what to pack for a Mexico all inclusive holiday with a baby. Before deciding to rent a car, consider how long you’ll be in Mexico and what you realistically plan on doing. If you plan on spending most of your time on the beach, you can join a couple of tours on the days you plan to venture out. 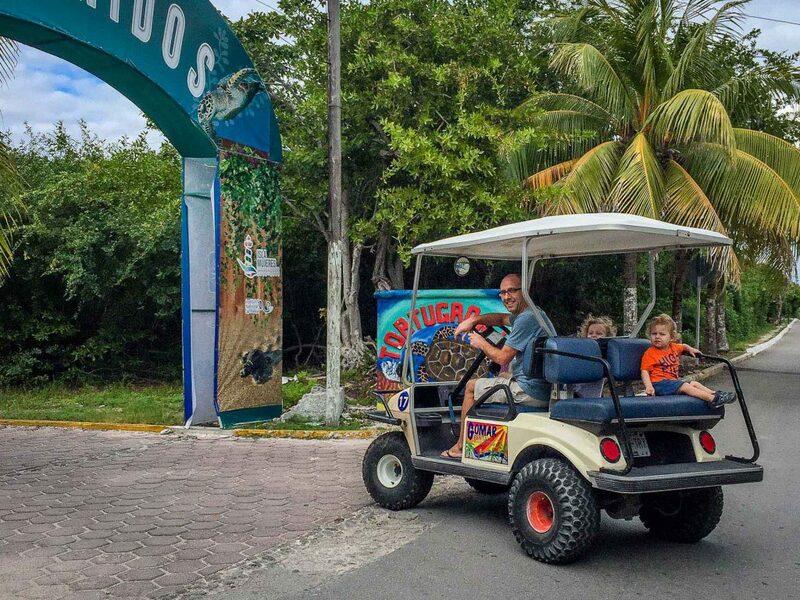 If you will be in Mexico for longer and the tours, taxis or public transportation aren’t an option for you, then make sure to read up driving around the Yucatan Peninsula. If you do rent a car, you can either bring your own car seat or rent when you get there. We recommend renting from a baby equipment rental company instead of the car rental agency. If you decide to fly with your car seats, be sure to keep them protected in a car seat bag. Click here to compare rental prices. Before you get too excited about how cheap it is, read up on scams when renting a car in Mexico. And now for the fun part, the list of things to do with a baby or toddler in Mexico. 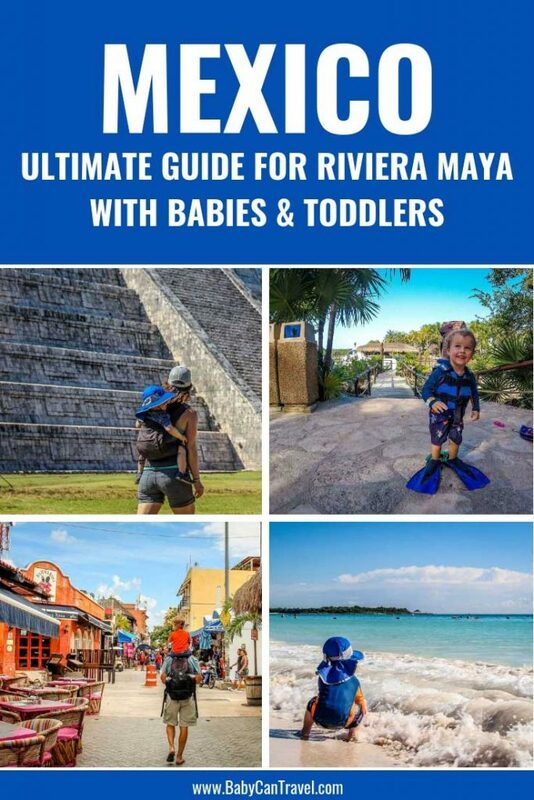 Each of the places listed below, we have done with a toddler who was 2 years old but we include tips on traveling to the Mayan Riviera with a baby as well. 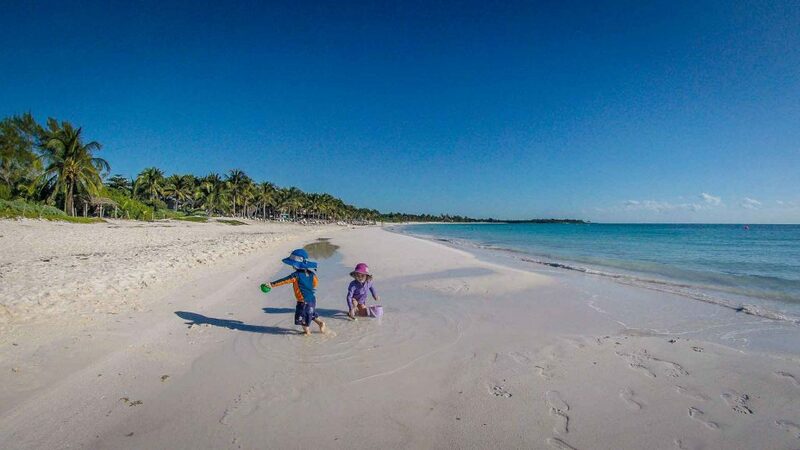 Without a doubt, beaches will be a large portion of your time in Mexico with a baby or toddler. 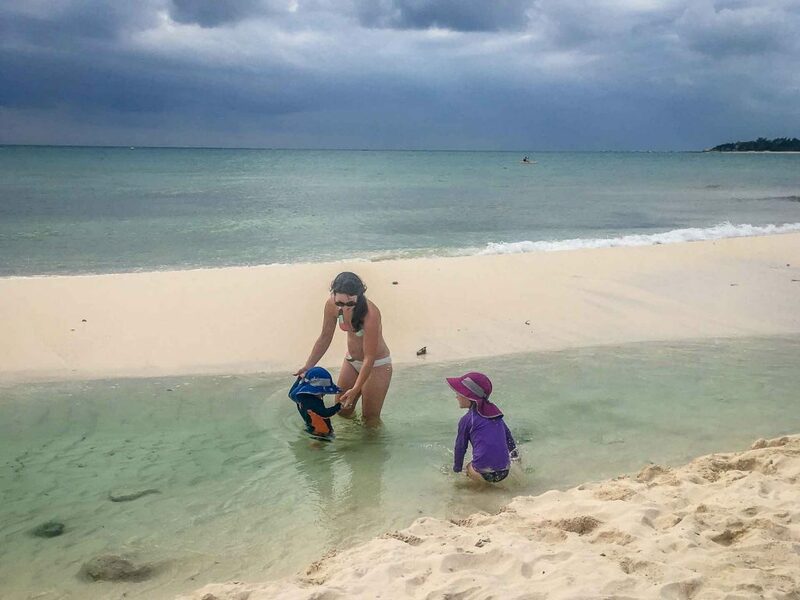 We loved all the public beaches in and around Playa del Carmen and found there was enough variety to keep us happy for a month in Mexico with a toddler and preschooler. 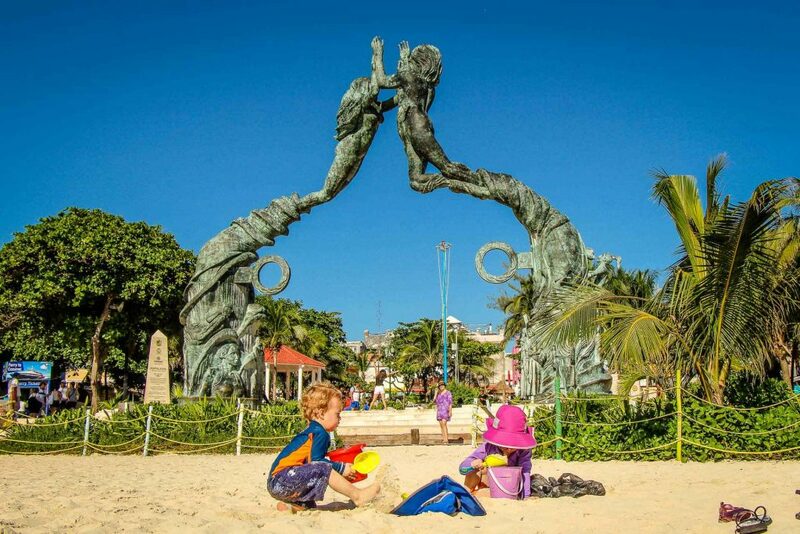 Playa Mamitas is a lively beach in Playa del Carmen that is a 22 minute walk from the main ferry pier. 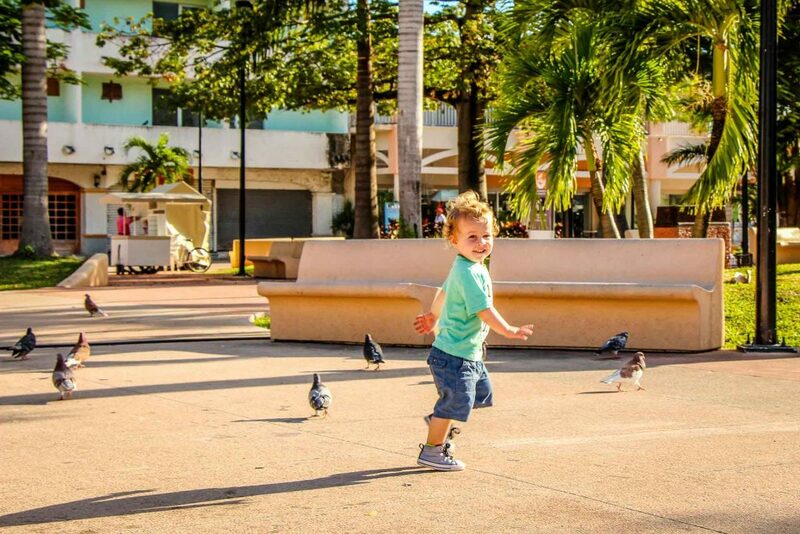 Enjoy the walk down the pedestrian-only Calle Quinta Avenida (5th avenue) and access the beach at Calle 28 Nte. This beach was clean with plenty of sand to play in and no rocks to trip up little feet. The day we were there, the water was calm with very small waves, though this can vary day to day. Behind the beach, you’ll find the Mamitas Beach Club which has sun beds for rent, a restaurant and a family area with a kid’s pool. Coco Beach is a local’s beach and you’ll find way less tourists here. The beach is backed by jungle instead of resorts, but the downside is that you’ll find some garbage on the beach. To get to this beach you’ll need find the path on the far side of the Reef Coco Beach Resort (past the gate at the entrance to the resort and the guard station). Though this beach was dirtier than the rest, it wasn’t horrible and it’s always nice to spend a day away from the crowds. The main beach in Playa del Carmen stretches from the ferry pier to Calle 10 Nte. With it’s proximity to the main tourist area of Playa del Carmen, it’s busy as you would expect, but don’t let that turn you off. The beach and water are stunning and you’ll have no trouble finding places to eat. Right near the ferry pier, you can also stop at Fundadores Park where there’s a great playground for little kids. You’ll also find Punta Esmerelda in the cenotes section, since it also has a cenote in the middle of the beach. The fresh water bubbles up into a lagoon which has a stream that runs into the ocean. 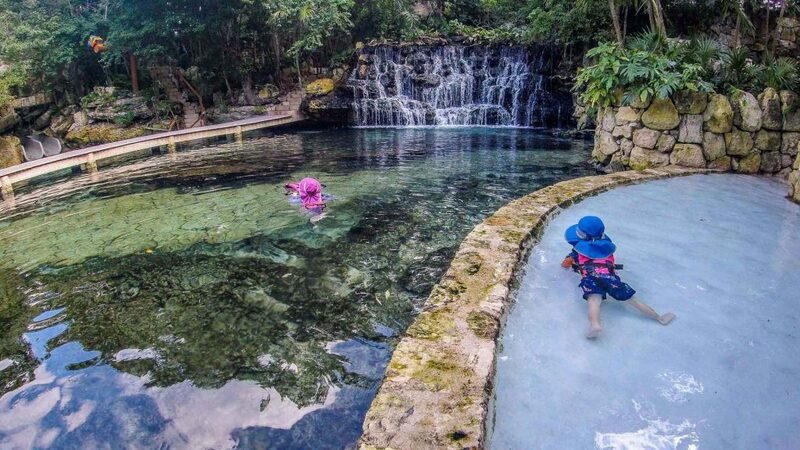 This is such a fun beach for babies, toddlers and small kids who can play in the shallow water (with no waves) of the cenote. The added bonus is the ocean is right there too. It’s the best of both worlds. Though Punta Esmeralda is still a local’s beach, there are resorts nearby and you’ll find other tourists here. You can expect it to be much quieter than the beaches in central Playa del Carmen though. 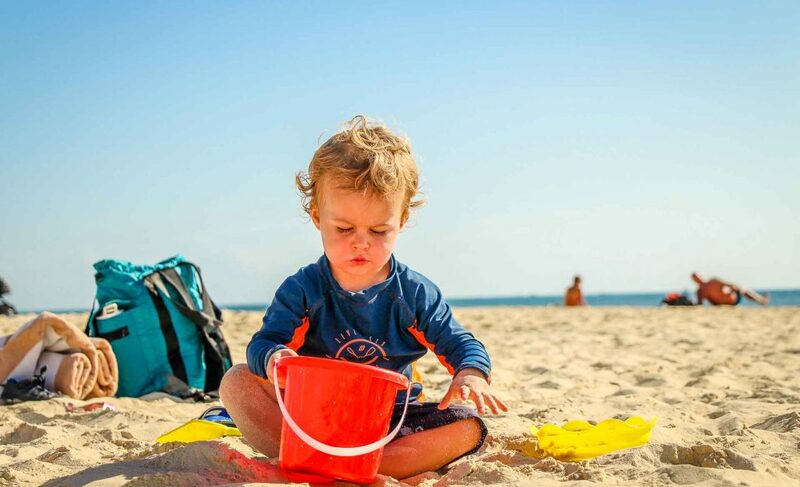 Don’t forget these beach essentials for toddlers! Xpu-Ha beach easily became our favorite beach during our time in Playa del Carmen and we returned there several times. We were fortunate that having a rental car made it easy to frequent this beach. There are a few resorts behind this beach, but it always felt so quiet. The water at this beach is nice and shallow for a long way out and the waves are relatively small, making it the perfect beach with a baby or toddler. There are also some rental equipment places along the beach, making it a fun place to try stand up paddleboarding. 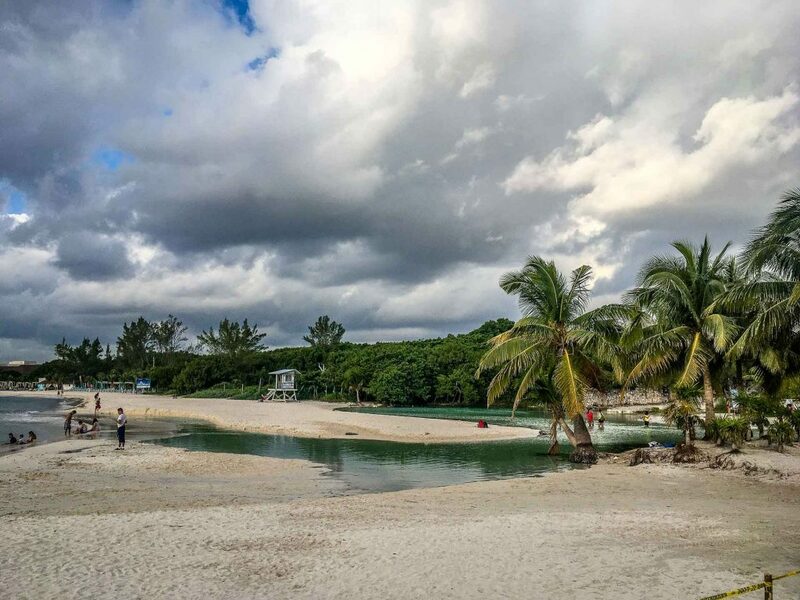 Note: there is a small fee to drive on the various road to Xpu-ha beach. Playacar is a gated community with expensive homes and also some large all-inclusive resorts nearby. The beach in front of the homes is relatively quiet, aside from the large amount of pedestrian traffic (i.e. resort goers) who are walking the beach. The real benefit of this beach is you’ll still be able to find seashells here which is a lot of fun for toddlers. A day trip to the Mayan ruins near Cancun and Playa del Carmen is a great way to take a break from the beach and enjoy a cultural experience. If you have a rental car you can easily do a self-guided tour of the ruins or hire a local guide when you arrive. Alternatively, you can book a tour that includes transportation. 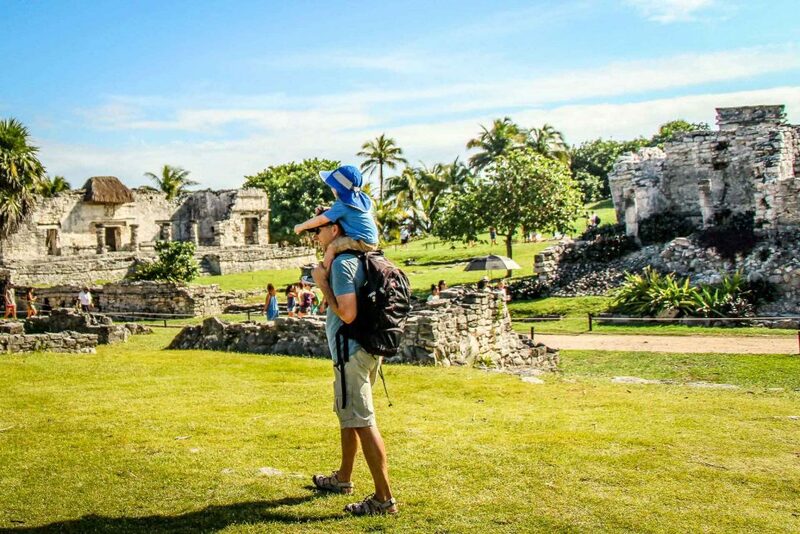 Each of the Mayan ruins near Cancun will provide a different experience, so if you only visit one choose the one that offers the type of experience your family is looking for. Also, plan your visit early in the day when there are less people and it’s not quite so hot. The Mayan ruins of Coba are set deep in the jungle and is the only one of the three where you’ll still be able to climb the pyramid. 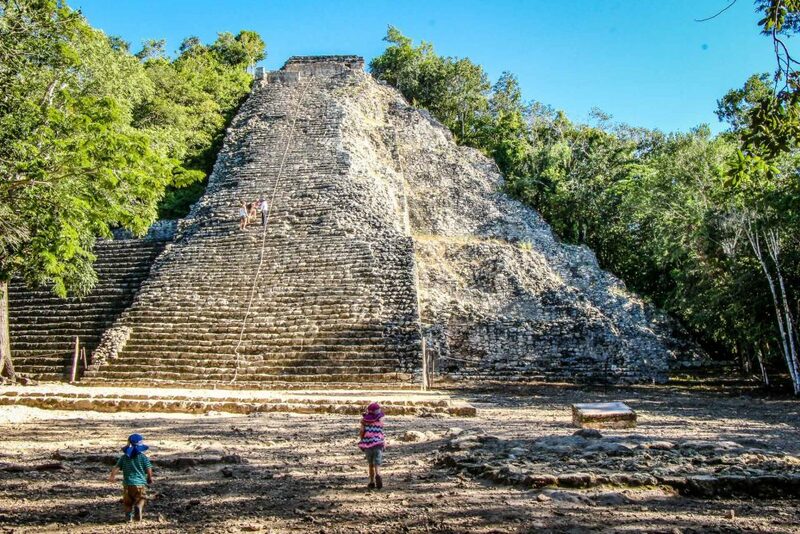 The Nohoch Mol pyramid in Coba is the tallest Mayan temple in Mexico and you can climb the 120 steps right to the top. The stairs are worn from so much traffic and can be quite slippery. It doesn’t take long to get to the top, so taking turns while someone waits with your baby or toddler at the bottom is completely doable. We do recommend going straight to this pyramid when you arrive as that’s when you’ll find it to be the least crowded. 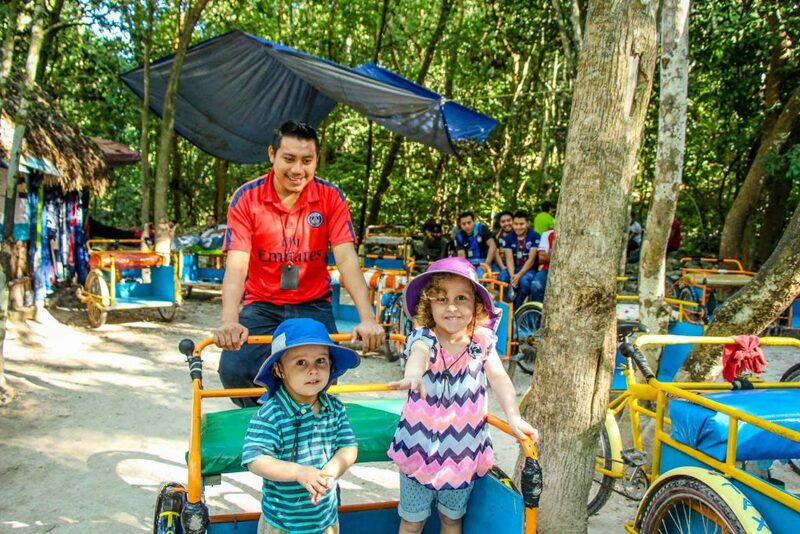 Visiting Coba with a toddler can be a really fun experience, your toddler will love getting a ride on one of the bikes! Just be prepared with plenty of water and mosquito repellent! Where Coba will give you that sense of being deep in the jungle, Tulum will wow you with its ocean side setting. If you are more interested in the setting over a walk in the jungle, then plan a day at Tulum. 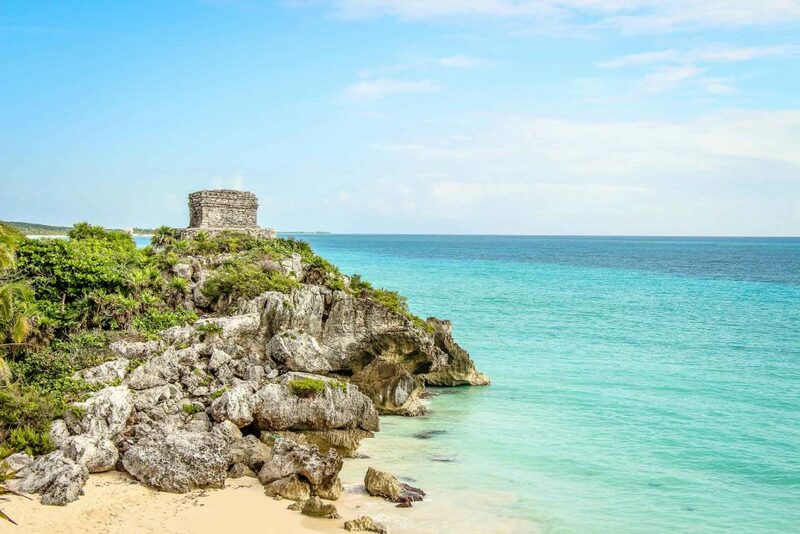 The Tulum ruins are set high up on a cliff overlooking the stunning turquoise waters of the Carribbean. The difference is that you’ll find very little shade here and it will get hot. Don’t forget those sun hats and sunscreen. Tulum is the third most visited site in Mexico and it’s not a very big complex, so try to arrive early to beat the crowds. 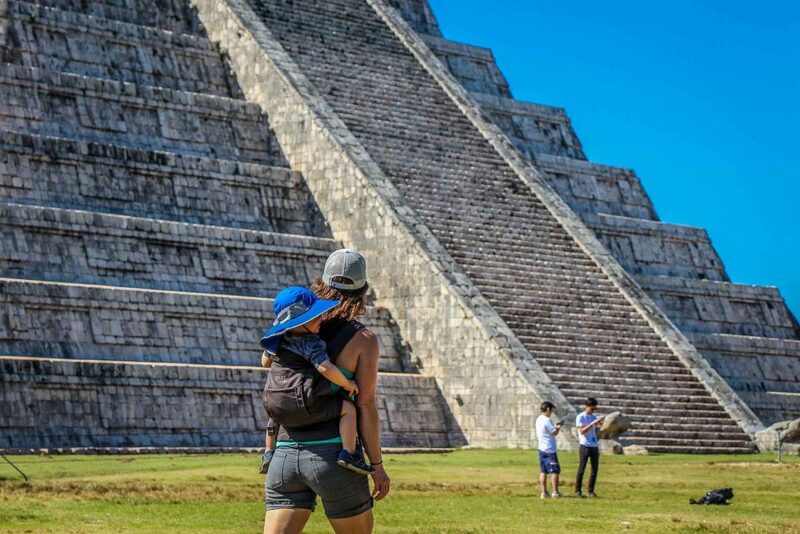 Being one of the “New 7 Wonders of the World”, Chichen Itza is one of the busiest places you’ll visit in Mexico. It’s worth a visit to see that iconic pyramid, El Castillo. To learn more about these Mayan ruins, you can hire a private guide with transportation. Avoid visiting on a Sunday, when locals get free admission and it gets even busier. Again, it will get very hot so don’t forget those sun hats, sunscreen and plenty of water. If you don’t have your own rental car, these top-rated day trips to the Mayan ruins would be a great option. 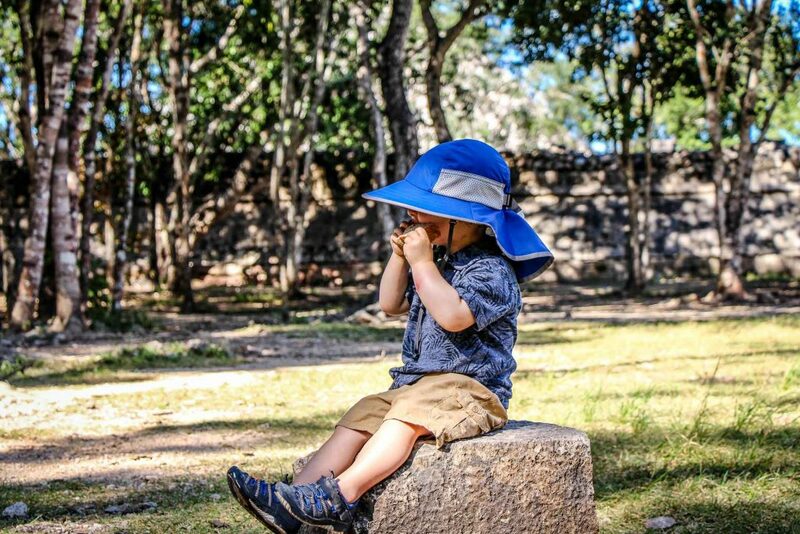 We really enjoyed visiting each of the Mayan Ruins with a toddler and would recommend planning at least one day trip. 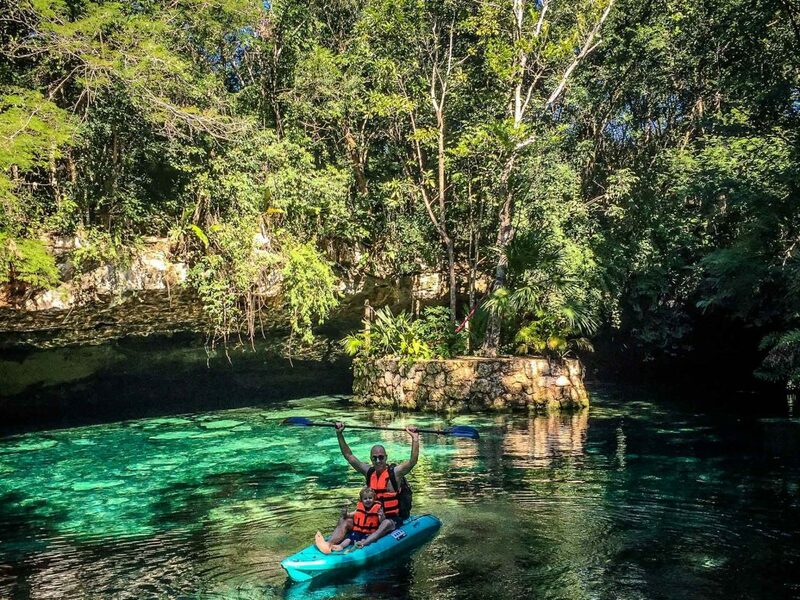 To cool off after your visit to the Mayan ruins, plan a stop at a nearby cenote! Cenotes are natural sinkholes caused when the limestone bedrock collapses. They are then filled with ground water. Often you’ll find the ground water to be very cold, especially when it is not exposed to the sun. 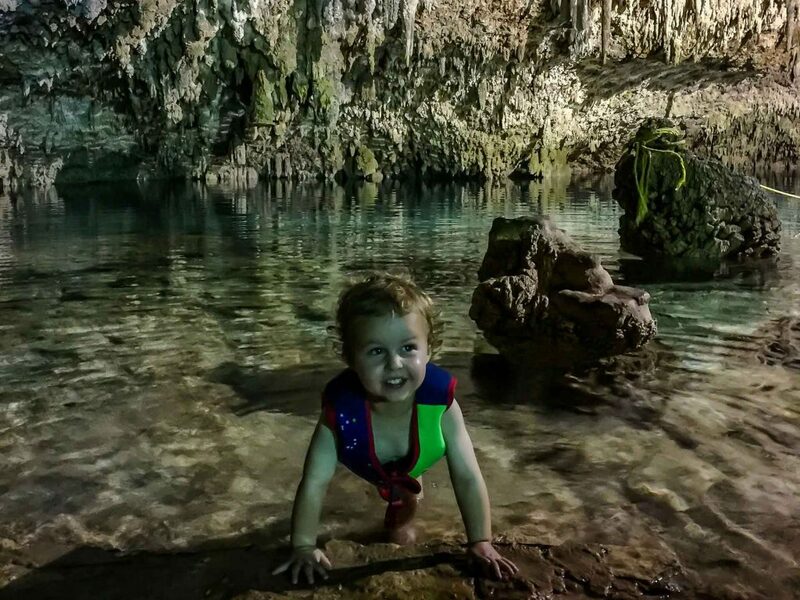 Many of the cenotes will be in large caves, which is a fun experience but if you are visiting with a baby or toddler they may not want to be in the cold water for very long. 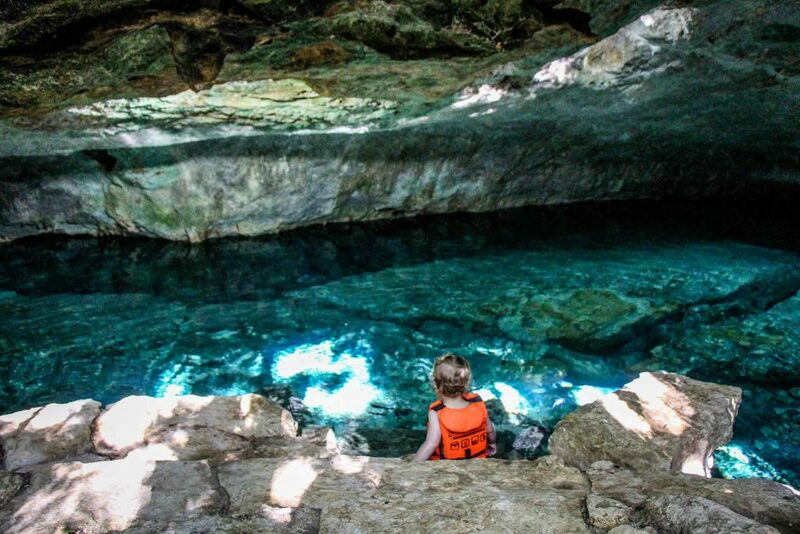 We recommend visiting cenotes that have a place where one parent can stay on the side with your baby or toddler and that are easy to get to the water. Some are very deep and may not have a shallow area for little ones to play in. We also recommend bringing your own life jacket for your baby or toddler, since it’s unlikely you’ll be able to get one small enough. Punta Esmeralda is listed under both our beach section and here because it has both. It’s farther away from the main tourist area in Playa del Carmen, but worth the time to get there. This cenote is open and has some of the best shallow areas for a baby or toddler to play in, especially since there are no waves! There is a small current where the ground water runs into the ocean, so keep your baby or toddler close. 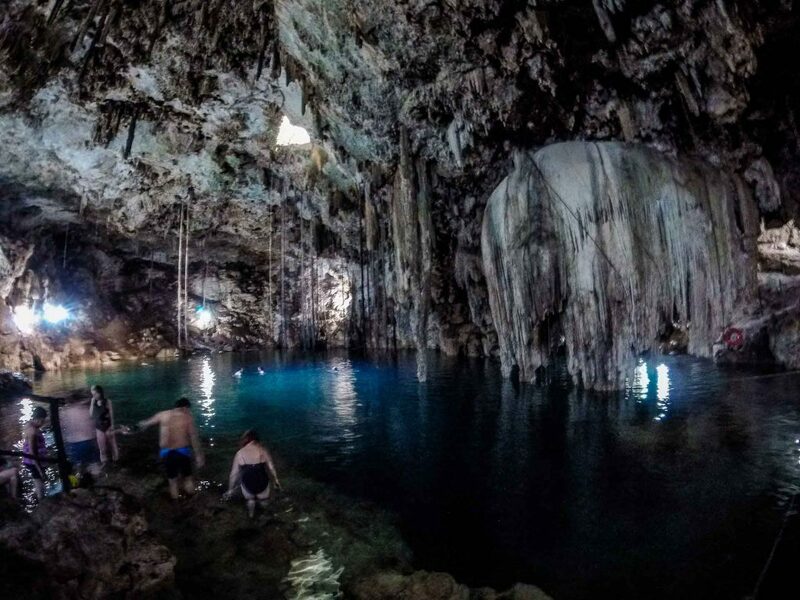 If you are visiting Chichen Itza, you can skip the cenote that’s part of that complex and come to this eco-park with two cenotes instead as you’ll find it less busy. There is a large area in the Dzitnup cenote where you can sit along the edge, making it a good place to visit with a baby or toddler. The water is deep and the entrance is quite rocky, but you could still get into the water with a toddler here. We do recommend having a life jacket of some sort for little ones here. We also recommend having towels as you’ll feel cold in that underground cave when you come out of the water! After the jungle walk at Coba and a good lunch, it’s worth it to visit the Choo-ha cenotes which are only a 10 minute drive away. The local Mayan community owns and operates these three cenotes and your entry fee helps to support the local people. There are 3 cenotes here but we only visited Choo-ha since it seemed the most toddler friendly. After the long stair case down (best to carry little ones down these stairs), there were plenty of places our toddler could splash around and enter the water as much (or as little) as he wanted. Kantun-chi is a more developed eco-park than some of the other mentioned cenotes, which are still quite “rugged” with wooden stairs to enter and very simple facilities, so you can expect to pay a lot more to visit these cenotes. 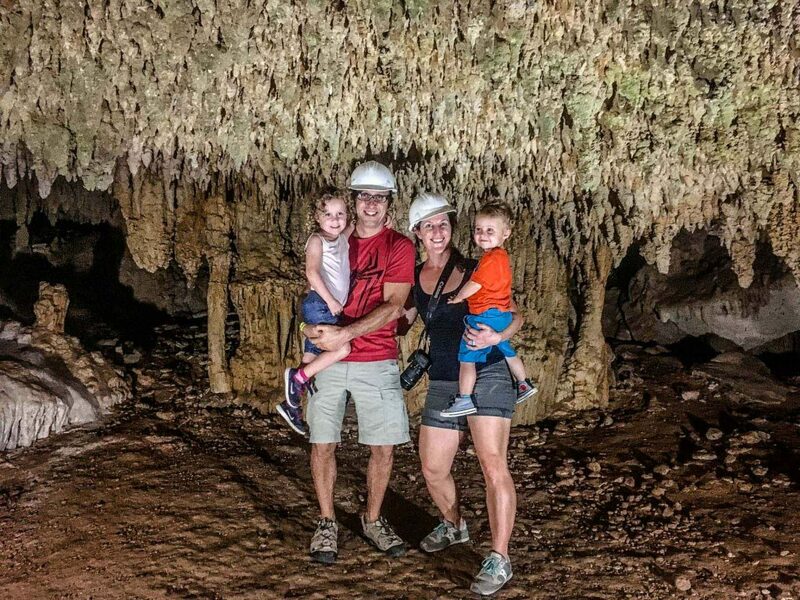 In this park, there are 4 cenotes that are all suitable to take a baby or toddler plus two others if anyone is interested in the underground river tour through two cenotes. Three of the cenotes are underground or in large open caves, where one is completely exposed to the sun. There are also kayaks available at three of the cenotes. 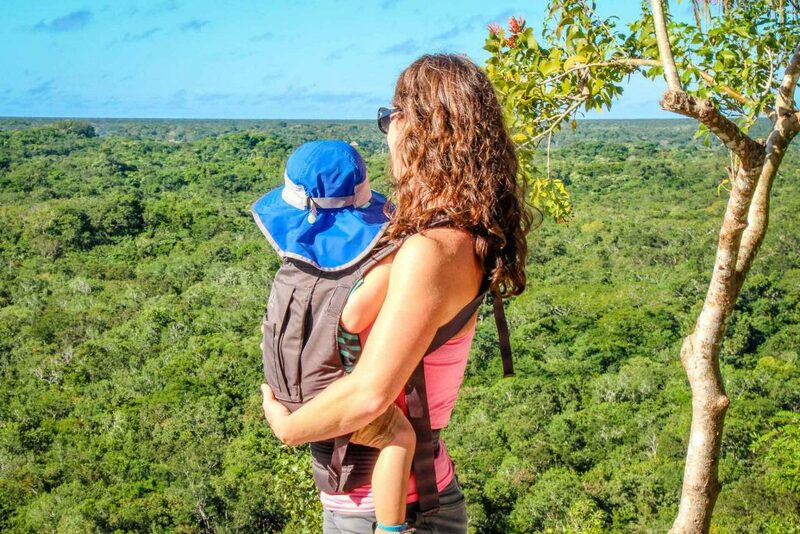 You might think that visiting some of the Eco-Parks in the Mayan Riviera won’t be worth it with a toddler or baby, but that isn’t the case. 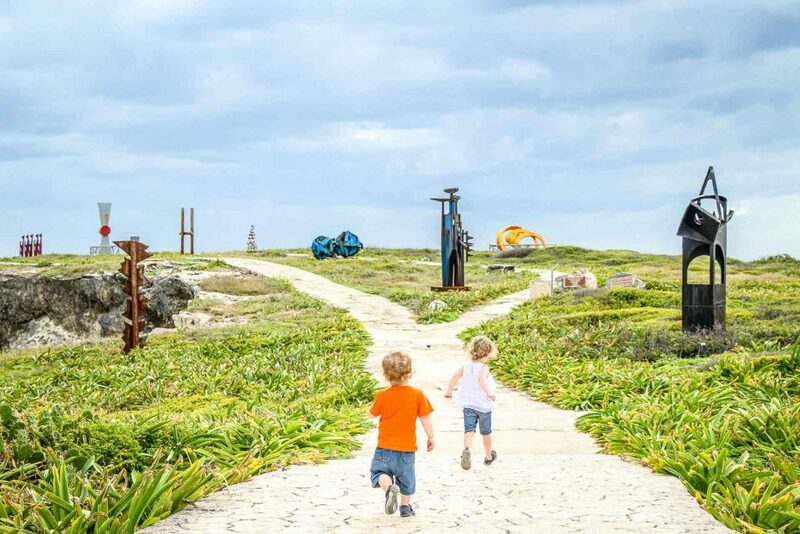 When you feel it’s time to do something other than play at the beach, here are some of the best eco-parks to visit with your toddler. 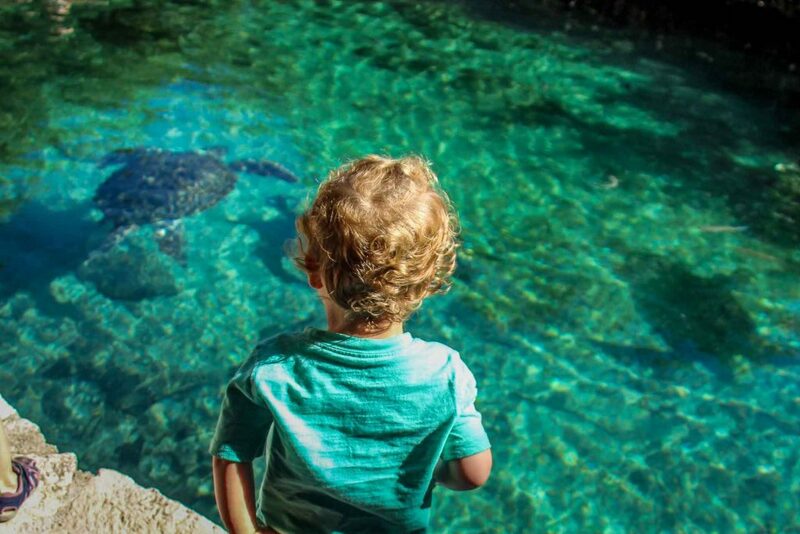 We found Xcaret to be the best Eco-Park to visit with our toddler. There was so much to see and do there that we had no issues filling up our day. Between the butterfly pavilion, the sea turtles and the Children’s World our two kids were in absolute heaven. 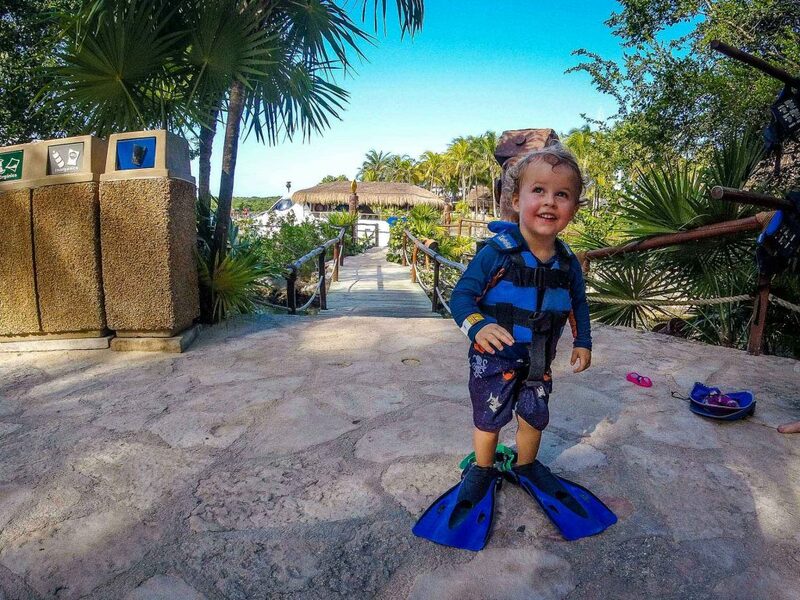 We had so much to share after visiting Xcaret with a toddler that we wrote two posts on our other blog about having the best day at Xcaret and our best 15 tips for visiting Xcaret. 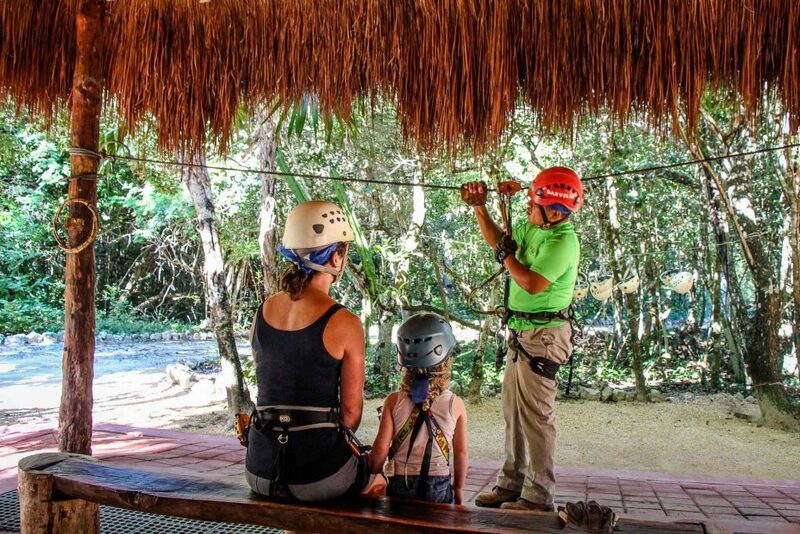 Xel-Ha is another large eco-park full of family fun. There are more areas here that you won’t be able to enjoy with a toddler, but there’s still plenty to fill a day. The river tour was our toddlers favorite part of the day, aside from the playground and small pools, of course. Keep in mind that this park is big, so having a stroller or baby carrier for your baby or toddler will help you get around easier. 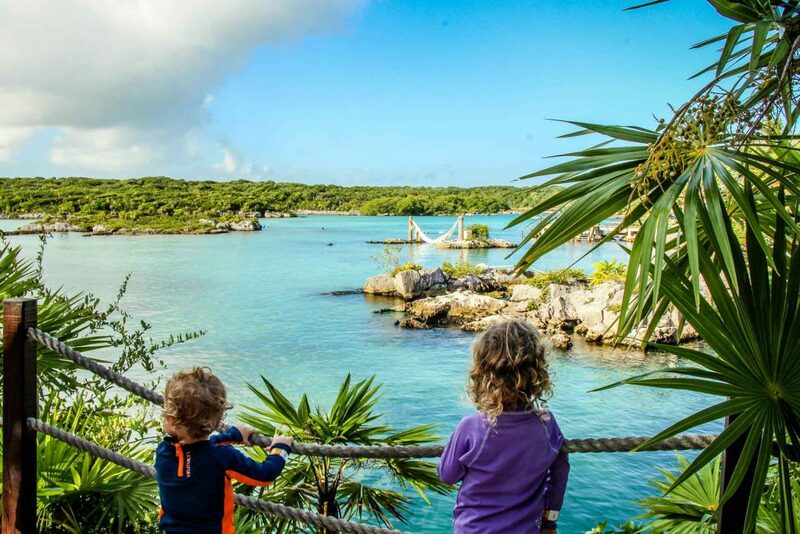 Click here for our best tips on visiting Xel-ha with kids. Likely the place both our kids remember most from our month in the Mayan Riviera is the Akumal Monkey Sanctuary. 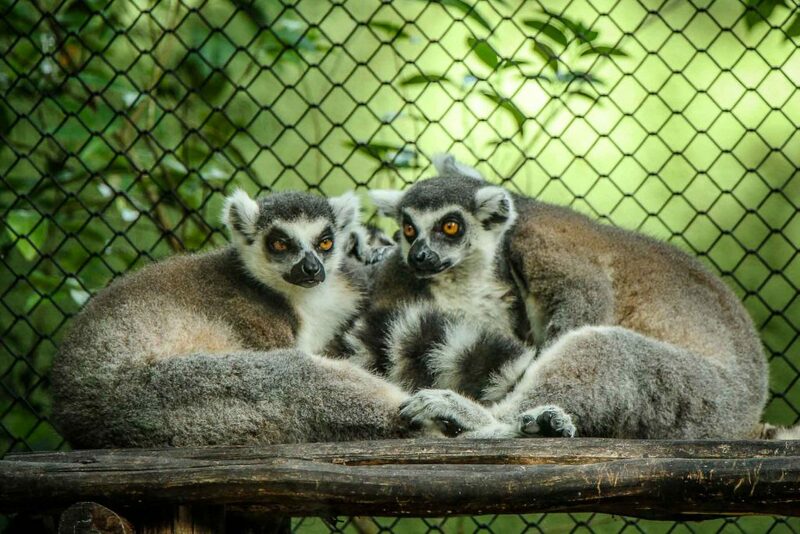 Home to many rescue animals, most who were exotic pets, this place has so much more than just monkeys. The tour starts with feeding goats and deer, moves to holding macaws and boa constrictors then ends with feeding the cutest little spider monkeys. The staff was very good at making sure our kids felt comfortable with the animals and didn’t encourage or push the animal encounters on anyone who didn’t feel one hundred percent comfortable. 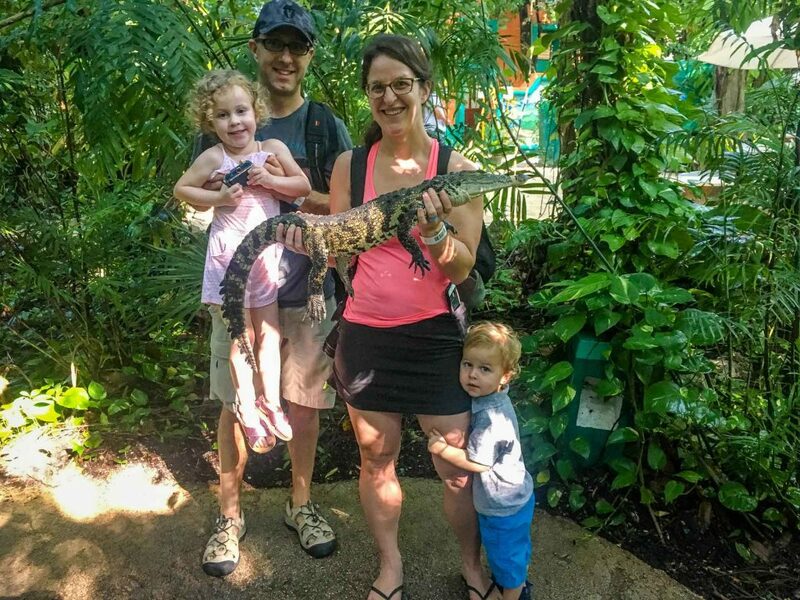 CroCo Cun Zoo is a fun and interactive zoo, filled with local animals like parrots, iguanas, crocodiles, spider monkeys and hairless dogs. 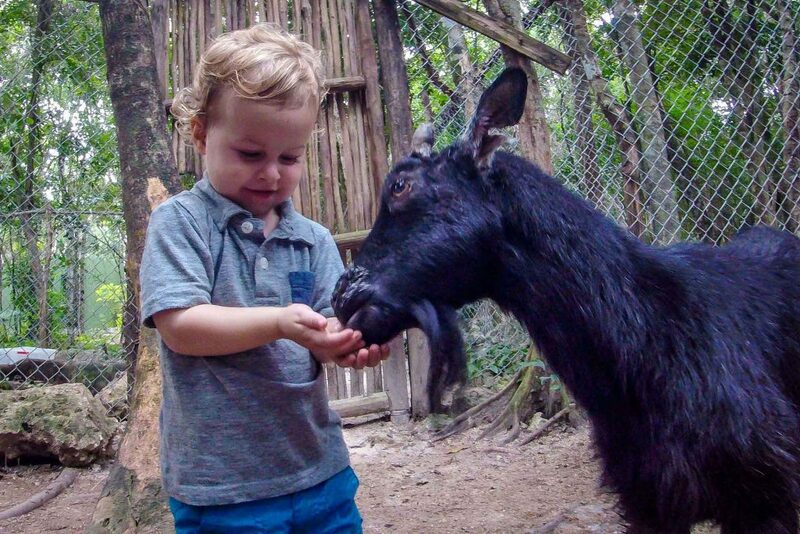 If your toddler loves animals, this a great outing. It’s also a good place to get out of the sun, since you’ll spend most of the time in the shade of the jungle. Just don’t forget the bug spray. We also visited Aktun Chen to give our daughter a chance to go ziplining for the first time. Our toddler didn’t get to participate in this and had to wander around the park with Dad until we were done. Since we were already here, we also did the cave tour, which ended up being a lot of fun and both kids really enjoyed it. 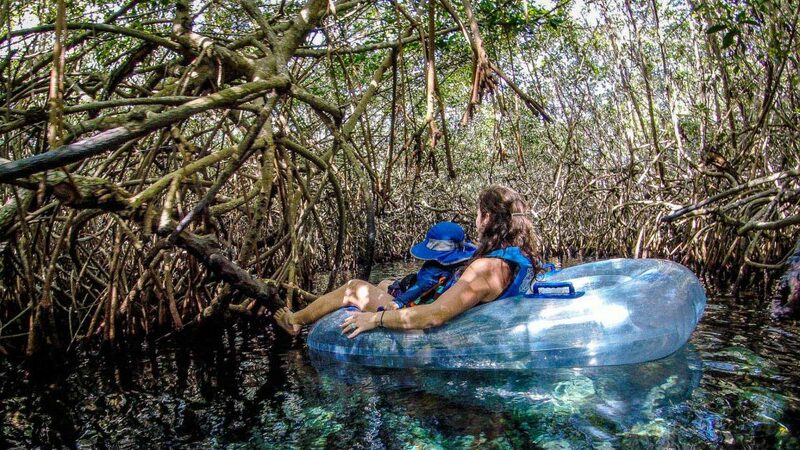 Learn more about these top eco-parks in the Mayan Riviera. If you aren’t staying on Isla Mujeres, then consider going there for a fun day trip on the Mayan Riviera. You can rent golf carts near the ferry terminal and tour the island. Your toddler is guaranteed to love riding around on the golf cart. 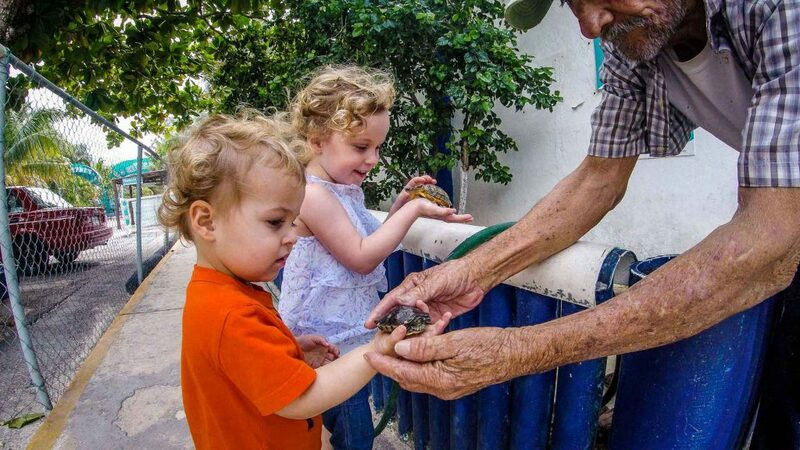 Tortugranja, a turtle farm, is a fun place for kids on Isla Mujeres. It’s not a large facility, but if your kid loves turtles they’ll see plenty of them here. Next, drive up to Punta Sur, the southern most tip of the island. It may not sound like much but it ended up being my favorite part of the day. The scenery is incredible and the walk through the sculpture garden is a lot of fun. 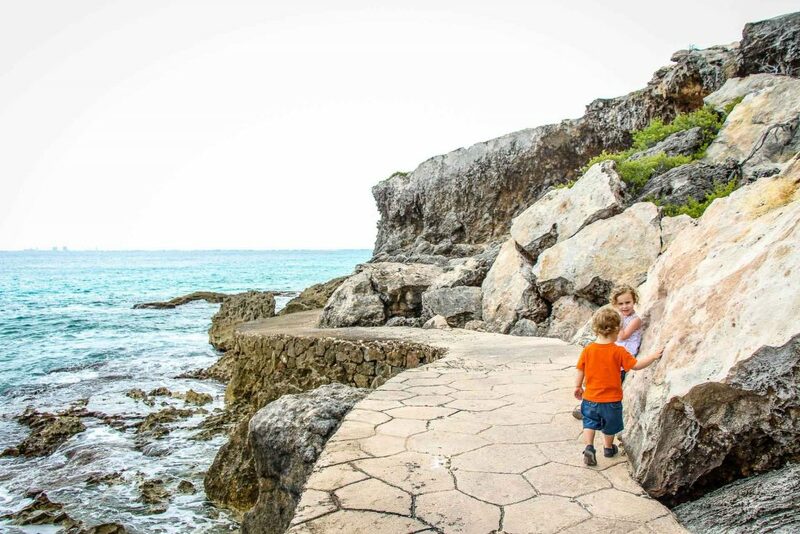 There’s an incredibly scenic path that goes down below the sculpture garden along the rocky cliffs, just keep your toddler close as there are no safety guards along the sides of this trail (better yet, this is a great spot for a shoulder ride!). 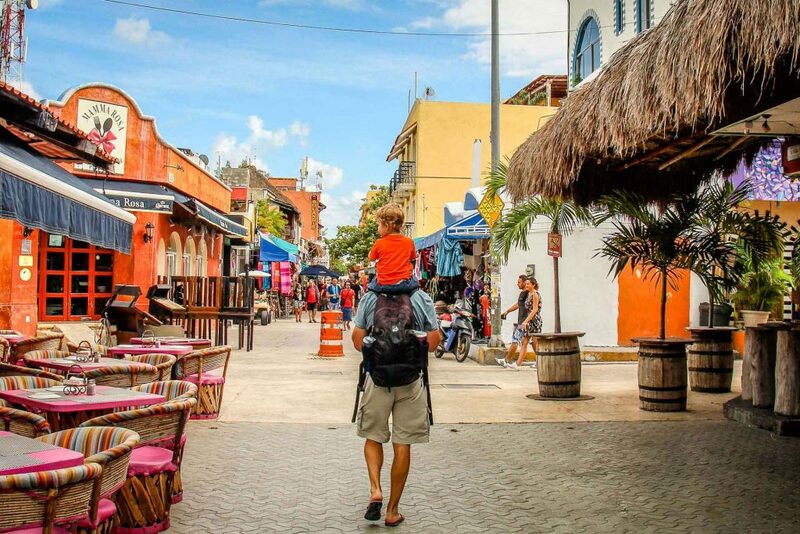 Finally, a walk through the lively town and a stop at the beautiful Playa Norte will fill up the rest of your time on Isla Mujeres with kids before heading back to the ferry terminal. 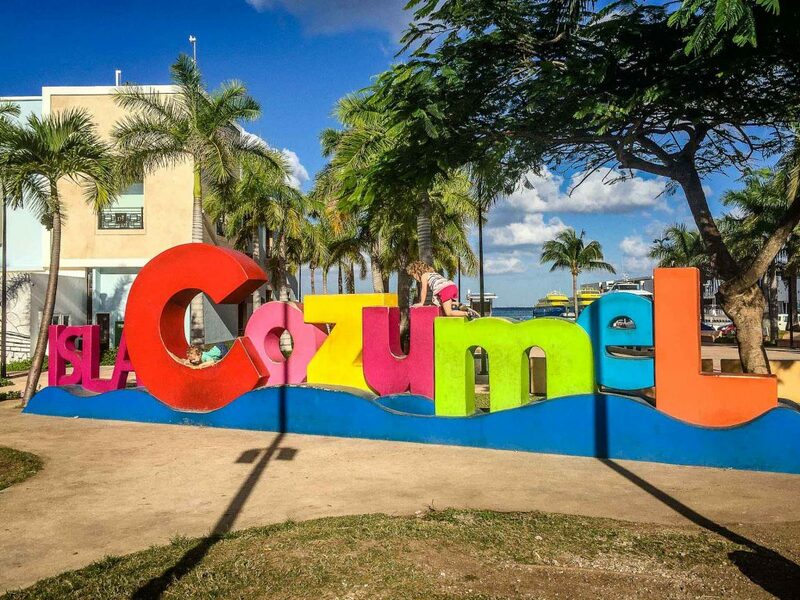 We did a day trip to Cozumel from Playa del Carmen and really enjoyed our walk through the town, but because we hadn’t planned on doing any snorkeling tours there really wasn’t much else for us to do there. Read this post for all our favorite restaurants in Playa del Carmen, but one that you should not miss is El Fogon. 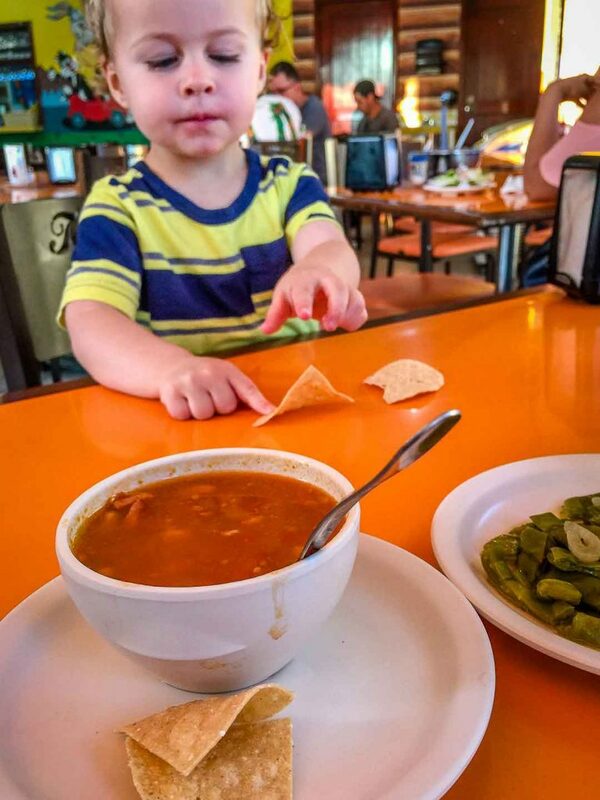 Make sure you try their bean soup! 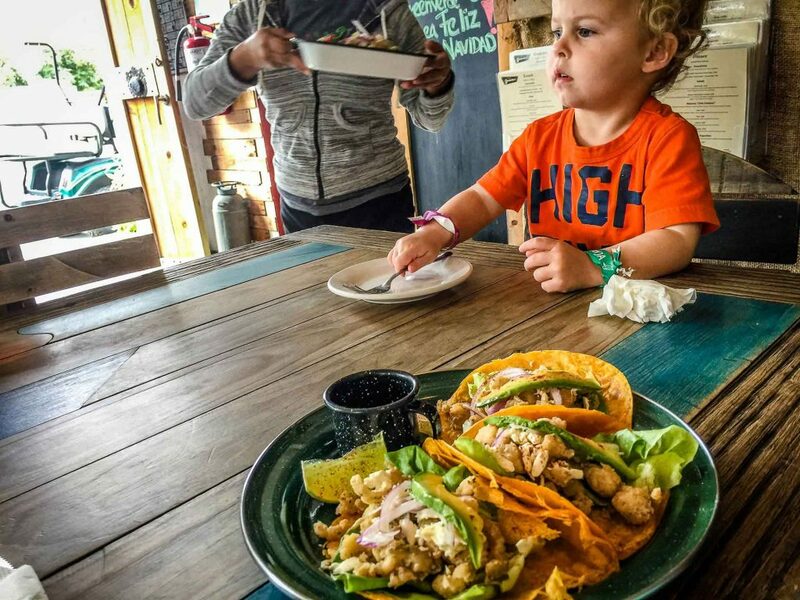 During our day trip to Isla Mujeres with kids, we stopped for lunch at Green Verde. It was a small restaurant but the Mexican food was delicious! 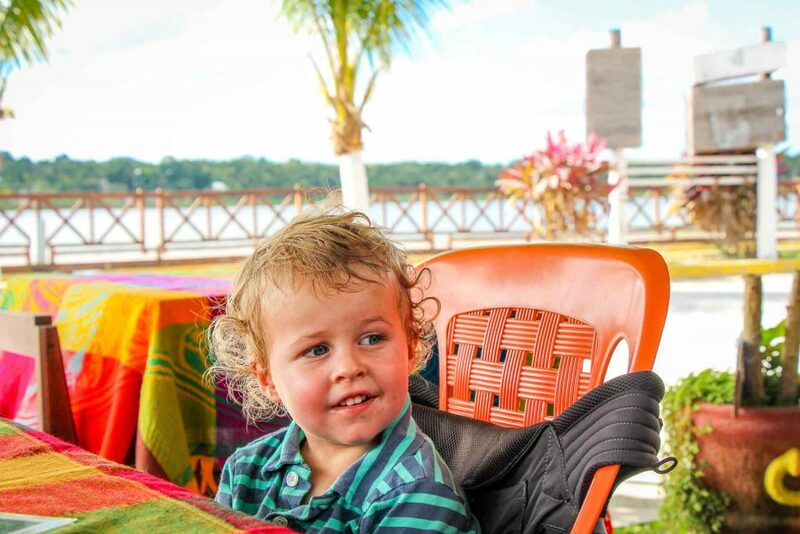 In between our visit to the Coba Ruins and our time swimming in the Choo-ha cenote, we had a simple, yet delicious lunch at El Cocodrilo overlooking the lake. For authentic Mexican food, don’t miss El Taco Maya in Akumal. It’s a small local restaurant, but we loved the pork tacos so much that we made a return trip! If you do plan to rent a car and bring your own car seat, purchase a car seat cover to give it the best protection on the flight. We have been very happy with this one. If you are staying at an all-inclusive, contact them to find out if they have a suitable travel crib available. If you plan to bring your own, look at these best portable travel cribs for babies and toddlers. For getting around with your baby, here are our recommended lightweight strollers and best baby and toddler carriers for travel. If you plan to have your baby sleep in the stroller, the CoziGo stroller cover is the safest way to go when it’s hot and will block 97% of the light! 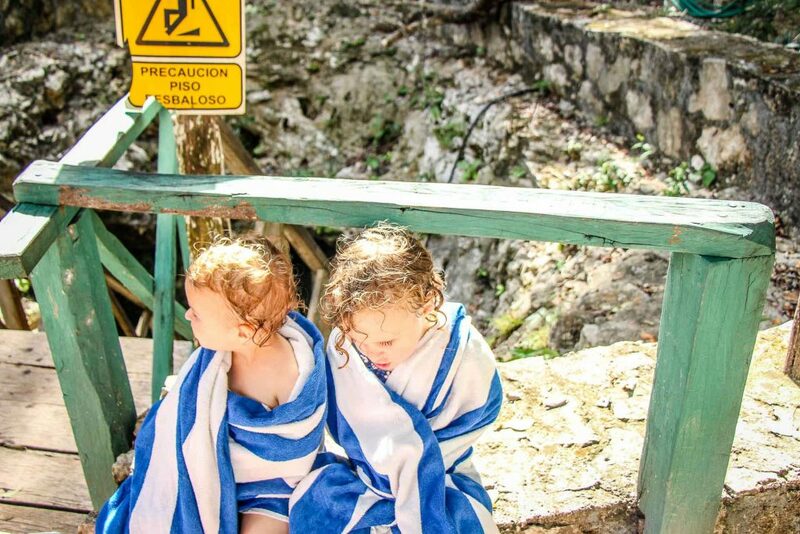 Don’t forget a life jacket (we use this swim vest) and towels for visiting the cenotes with a toddler or baby. 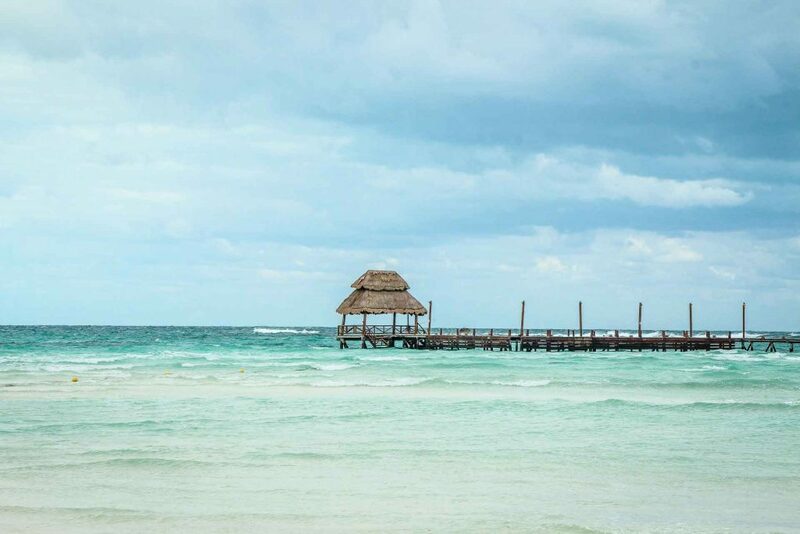 Need more help planning your trip to the Mayan Riviera? 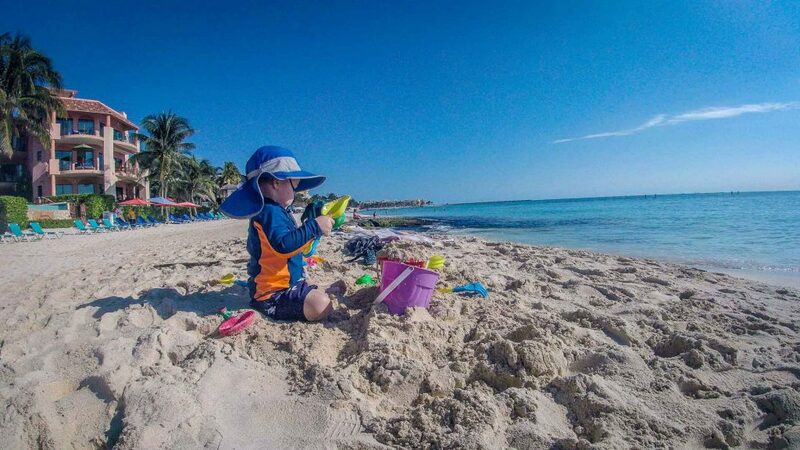 We have all the resources to help you plan your best trip to Mexico with children!